EraGem Blog: Is Red Your Color? Choosing a colored stone for your engagement ring is a decision you'll want to make carefully. One of the reasons diamonds have become such an enduring choice is because they literally go with everything. They match every outfit and complement every mood. Still, for some, color is everything. And a colored gemstone might be the perfect choice for you. In order to help you decide which colored gemstone will suit you best, we've started this series: What's Your Color? Do you love red roses, fireside chats, and lobster tail? Do you prefer tropical heat and autumn leaves? Do you find yourself drawn to cherries, strawberries, and raspberries? If you answered yes to any of these questions, red might be your color. Red is the color of BLOOD, LIFE, and LIFE ENERGY. The color red has long been associated with protection against death, sickness, and evil spirits. Red is associated with power and dominance. Red is the color of pleasure, sensuality, passion, and arousal. If you found yourself identifying with any of the above traits, or if you're often choosing red accessories for your wardrobe, red paint for your walls, or red accents for your living spaces, then you might enjoy wearing a red gemstone in your engagement ring. Of course, you can't go wrong with a ruby. Rubies tend to run in the cooler tones, from pale pink to rich violet red. If you prefer the warmer tones, then you'll want to look carefully for a pigeon's blood ruby, and make sure you look at it under many light conditions and from many angles, as the appearance of color in a ruby tends to change from different directions. 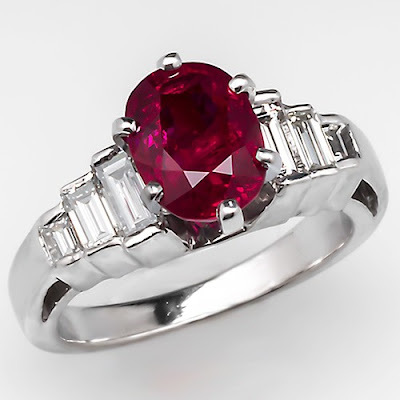 If you prefer a stone other than the ruby, then may we suggest a red garnet, tourmaline, or a padparadscha sapphire? All of these stones weather daily wear well. If you think red might be your color, then we invite you to visit our showroom for a chance to put your color to the test. We would love to show you our selection of red rubies, garnets, tourmalines, and sapphires. Click here to schedule a visit today. Douma, M., curator. (2008). Pigments through the Ages. Retrieved July 22, 2015, from WebExhibits. Robson, David. "How the Colour Red Warps the Mind," BBC Future. Accessed July 22, 2015, from BBC Future. Williams, Shirley. "The Many Meanings of Red," Color Wheel Artist. Accessed July 22, 2015.